Spring is awakening here in Iowa, and for us that means getting outside, doing some yard work, and getting some early work done with our garden. With a three year old and a one year old in the house, we try to get everyone involved in the gardening process. 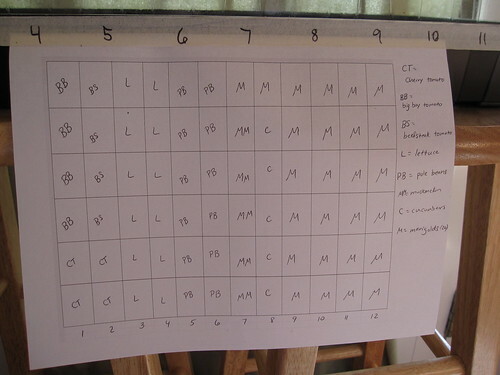 My wife journals extensively, so for this post, I’ve borrowed some of her writing about the garden to help describe some of the early steps for our 2009 garden. She also explains quite well how exactly we get our children involved with our gardening plans. Today I took the kids to do some shopping. I was just intending to get peat pellets to start the seeds in, but when I got there I saw a whole set-up with 72 peat pellets in a tray with a lid for $6. The tray is reusable, so next year I can just buy the pellets. In addition to the pellets, I also bought a bunch of seeds. I had Joe (our son) help me with this part. His current favorite vegetable is cucumbers, so we bought a packet of those. I also had him decide whether to get muskmelons or watermelons (he chose muskmelons). Katie’s (our daughter) favorite vegetable is broccoli, but I couldn’t find any seeds for that. I will have to go to another garden store for those. In addition to the cucumbers and muskmelons, I bought pole green beans and three kinds of tomatoes –Burpee’s Big Boy Hybrid (“outstanding flavor”), Super Beefsteak (“large and disease resistant”), and Super Sweet 100 Cherry (“extra-prolific cherry”). We’re planning on turning a bunch of the bigger tomatoes into sauce, which is why I got two kinds. Along with the vegetables, I bought a packet of marigolds. My sister, who worked at an organic flower garden for a while, claims that marigolds keep away some bugs, so I always use them for borders in my vegetable gardens. All together, the cost before taxes for all of this was $13.50 ($6 for the tray, and $1 each for the seed packets, except the cucumbers, which were $1.50). Here’s our peat tray and some of the seeds we selected for use this year. The almanac was a Christmas gift – it’s a pretty good guide for identifying when exactly to plant in our area. We use it hand in hand with weather forecasts to make a good guess as to when it’s safe to put plants in the ground so they won’t be destroyed by frost. 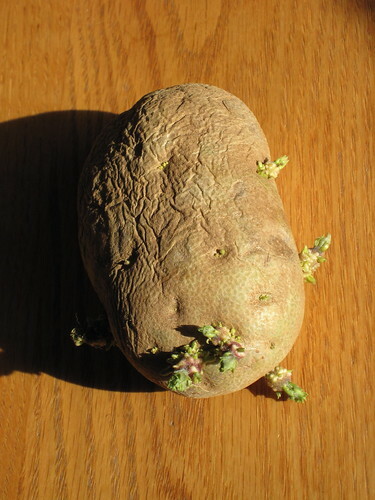 We’ll simply cut this potato up into pieces and plant the pieces directly in the garden. The potato sprouted perfectly in a bag in the pantry, where it’s fairly warm and quite dry. We get the kids involved by having them make several choices about what we plant. Last year, for example, our son Joe was wild about planting carrots, so we planted quite a few carrots in the garden. This year, he was much more enthusiastic about the melons, but our daughter is crazy about broccoli. By growing things that the kids are excited about eating, they become excited (by extension) about the garden as well. Today I worked on clearing the garden of last year’s dead plants, and I also did some weeding. The nice thing about clearing out old dead plants is that it’s really easy to have young children help. Basically, they can’t pull up the wrong thing. If it looks dead, pull it up. After pulling up dead plants in both the vegetable garden and the ornamental gardens in the front, I’m realizing that our one barrel composter isn’t going to be nearly big enough for all of the garden waste we generate. I’m considering starting a plain old ordinary compost heap behind the vegetable garden. I also checked out the perennials that we planted last year. Some of the herbs seem to be coming back, and the strawberries are definitely coming up. In fact, I’m a little worried that the strawberries will try to take over the garden. I don’t see any asparagus yet, but I think it’s a little early for those. I also set the chicken wire around the garden back up. I’d hate to have the young perennials eaten before they have a chance to get going. In the evening, I had Trent and the kids help me add water to the peat pellets. The tray required 10½ cups of water, so Trent brought water over in measuring cups, the kids poured it in the tray, and I helped make sure Katie didn’t pour the water over herself and the kitchen floor. We couldn’t plant the seeds yet, because it takes peat pellets a while to soak up water. Here’s our mostly-cleared garden as it sits right now. We didn’t get the covering off the ground last fall before the first blizzard came through, dumping more than a foot of snow on us which remained for months. We hoped that the covering would be in good shape in the spring – and it is pretty good, at least usable for the coming year. 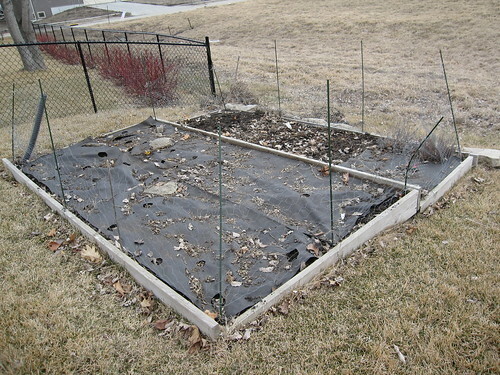 Soon, we’ll strip the covering off the garden, spread some compost, and till the whole thing just before planting. Since we do not own a tiller (and don’t have extensive need for one), we’ll either borrow a small one from a neighbor or perhaps rent one for a day from the local hardware store. 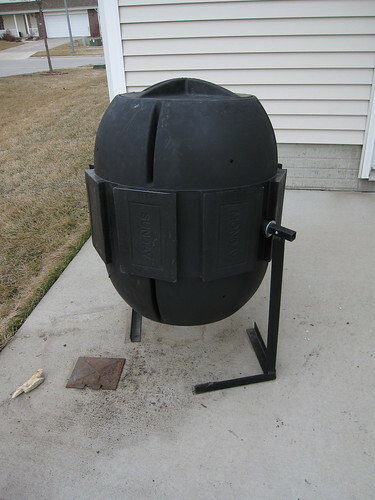 Our composter is a great size for catching a small amount of yard clippings and all of our vegetable table waste, but it’s not exactly big enough to deal with a huge amount of garden waste. Thus, we’re discussing getting either a second barrel composter or perhaps a small chicken wire composter. In this picture, the compost is just beginning to work. We’re keeping it moist with very warm water and occasional spadefuls of dirt are tossed in to add microbes to continue the composting process. Our goal is to have nice, rich spreadable compost just before we begin to plant next month. The kids are at daycare today so that I can get a little bit of work done around the house before going back to teaching. This also lets me do some more of the time-consuming tasks that the kids would get bored with, like planting the seeds (they don’t really have the fine motor skills to help with that yet). 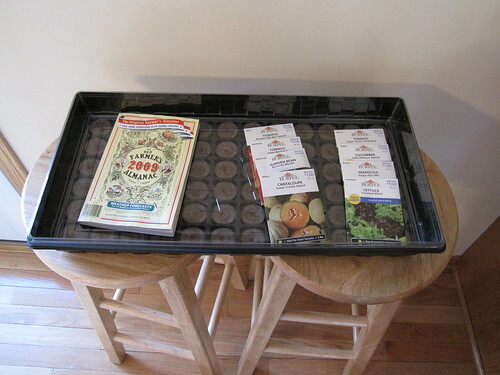 I started by planning how many of each kind of plant I want and deciding where to put them in the tray. 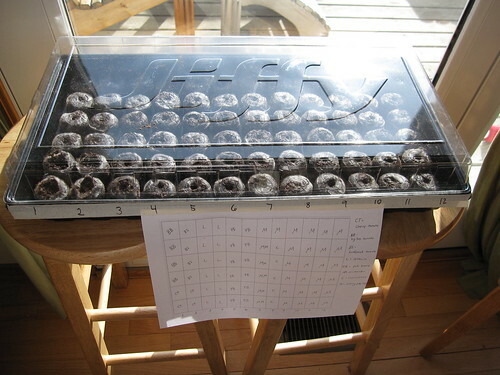 I printed out a map of the tray using a spreadsheet program, which I taped to the front so that I can easily see it while I’m planting seeds. I’m saving the extra seeds that I’m not using, in case something doesn’t grow, or I just decide later that I want more of that particular plant. Some plants, like lettuce, can also be planted a second time during the year. I also pulled out the Farmer’s Almanac that we got for Christmas and looked up when each thing that I’m growing should be moved out to the garden. 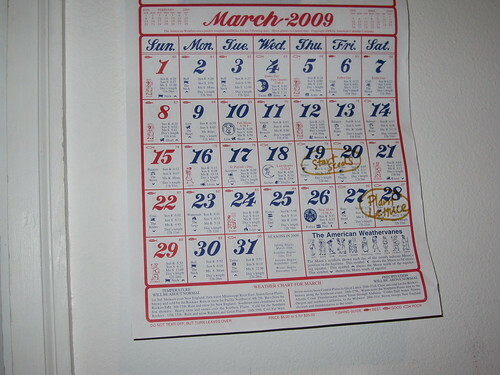 I wrote those dates on our calendar in the house, as well as one that we’ve got hanging in the garage with the garden tools. We started a bit later than usual this year with our seedling prep – usually, we’re getting this started much earlier in March. However, last year we lost a lot of plants to a late frost and we’re fairly timid about it. Plants will likely go in the ground much later this year, which does push our harvest well into August and early September instead of harvesting in late July and early August as we did last year. The sheet of paper there is a chart that shows what each spot in the tray contains. This simply helps us keep track of the planting. Also, here’s our garden calendar – the calendar itself is actually a free bank calendar with a bunch of astrological information already on it. Notice we’ll be planting the lettuce on Friday or Saturday. Lettuce is hardy and will survive a spring frost or two. Our April calendar has quite a few dates marked in a similar fashion. In a month or so, we’ll offer an update discussing the planting process.